A freewheel is a wheel attached to the frame of the wheelchair that allows it to go over a greater variety of grounds due to the size of the wheel and texture. 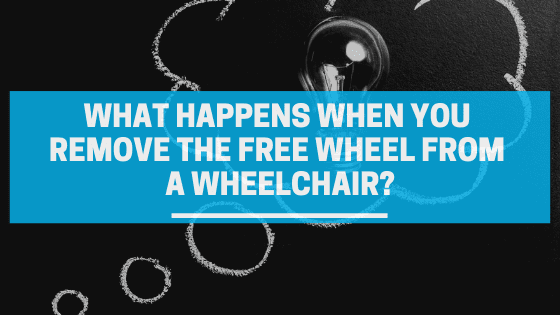 If the freewheel is removed the different type of ground will not be as easy or even possible to go over because the majority of the wheelchairs have two small wheels in the front that often are suitable for a specific type of ground like concrete or wood flooring. Removing the attached freewheel will also limit mobility as it provides a higher level of balance and instant turning. This attachment is perfect to use at the park with family and friends. It will allow for better mobility to play games with children and prevent tipping over. The freewheel attachment has an arched frame that allows for the wheel to rotate freely and a clamp at the end that allows it to attach onto the wheelchair. This instantly increases mobility because it elevates the front wheels slightly so that the back wheels and the freewheels have more support. With the support no longer on the front wheels, which are smaller and not as mobile, the wheelchair user can use the freewheel as support to go over sidewalks, bumps, grass, gravel, and loose dirt. To attach the freewheel onto the chair, the wheelchair should have a support bar in front by the foot-rest. This ensures that the freewheel remains attached and won’t come off which can cause unbalance when in use. Also, by elevating the front of the wheels it provides more mobility and balance. When attaching the freewheel it is important that it is extended before clamping it onto the frame. Once it is clamped the user should test it by turning in the chair a making sure the freewheel is securely on. To properly detach the freewheel you should extend it prior to unclamping to remove some support off and prevent damages or injuries. Once the freewheel is unclamped simply store in a bag and secure to back of the wheelchair. Many wheelchair users have benefited from the use of the freewheel and have brought joy to them due to the ability to be outdoors with such ease. Many are now able to play with their children, go on outdoor adventures with family and the most importantly complete daily task they couldn’t before.